Chromosomes labeled with green fluorescent protein are about to separate in this frame from a movie of dividing cells at the surface of a fly embryo (click here to watch movie). With adaptive optics for deep-tissue imaging, biologist William Sullivan hopes to extend his observations to cells below the surface of the embryo. Movie and images courtesy of W. Sullivan. 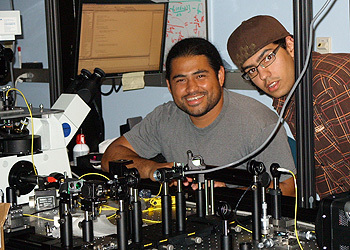 Graduate student Oscar Azucena (left) and undergraduate Ziah Dean helped develop the adaptive optics system for a wide-field microscope at UCSC. Photo courtesy of J. Kubby. Researchers at the University of California, Santa Cruz, are developing new microscope technologies to enable biologists to see deep within living tissues and observe critical processes involved in basic biology and disease. Funded by a $1 million grant from the W. M. Keck Foundation, the new W. M. Keck Center for Adaptive Optical Microscopy at UC Santa Cruz builds on efforts begun in 2006 by a multidisciplinary group of biologists, astronomers, and optical engineers. Inspired by adaptive optics technology for telescopes, which has allowed astronomers to see more clearly and deeply into space, the researchers are developing adaptive optics for microscopes to enable deep imaging of living cells and tissues. Principal investigator Joel Kubby, an associate professor of electrical engineering in the Baskin School of Engineering at UCSC, has worked on adaptive optics (AO) systems for large telescopes as well as for biological imaging. In astronomy, AO systems correct the blurring of telescope images caused by turbulence in the Earth's atmosphere. In microscopy, blurring is caused by the flowing cytoplasm of living cells. "We can get beautiful images of cells close to the surface of the tissue, but if you want to go deep you're out of luck because of the degradation of the image. That was the motivation for this project," said co-investigator William Sullivan, professor of molecular, cell, and developmental biology at UC Santa Cruz. "For cell biologists, anything that improves imaging is a big deal, and this has the potential to open up vast areas of cell biology that have been opaque to us." In stem cell research, for example, an important bottleneck in efforts to develop stem cell therapies has been the inability to follow injected stem cells and monitor their fates below the surface of the tissue. AO microscopy could solve this problem, and the California Institute for Regenerative Medicine (CIRM) has provided support for the work at UCSC, including funding that led to the development of the team's first AO microscope. Co-investigator Yi Zuo, an assistant professor of molecular, cell, and developmental biology, plans to use AO microscopy to extend her research on synaptic reorganization in the brain during development and learning. "So far, most of our understanding of synaptic remodeling in living brains has been limited to the superficial cortical layers," Zuo said. "AO microscopy will allow us to explore the structural and functional plasticity of synapses in the deeper cortex." UC Santa Cruz has been a hotbed of adaptive optics research since 1999 with the establishment of the national Center for Adaptive Optics (CfAO), based on the UCSC campus and initially funded by the National Science Foundation. A state-of-the-art Laboratory for Adaptive Optics was established on the campus in 2002 with funding from the Gordon and Betty Moore Foundation. Most of the AO research at UCSC focused on astronomy until Sullivan, Kubby, and Zuo began collaborating on the AO microscope project. "This is the kind of project that UCSC does really well. I couldn't have done this at a medical school, because they don't have astronomers and engineers next door," Sullivan said, noting that both CfAO director Claire Max, a professor of astronomy and astrophysics, and Michael Isaacson, the Kapany Professor of Electrical Engineering, provided valuable support for the project. AO systems for telescopes use a point-source of light--either a bright star or an "artificial guide star" created by a laser--as a reference beacon for measuring atmospheric blurring. The system calculates the corrections needed to counteract the distortion of the image, applies the correction by bouncing the incoming light off a deformable mirror, and repeats the whole process hundreds or thousands of times per second. The UC Santa Cruz project is the first effort to apply this approach to microscopy. "Other groups have tried to do AO microscopy using image optimization and other techniques. Our unique angle has been to develop a biological guide star as a reference beacon for the AO system so that we can measure the wavefront aberration [the technical term for the blurring effect] the way they do so successfully in astronomy," Kubby said. In addition to Kubby, Sullivan, and Zuo, the key personnel for the Keck Center for Adaptive Optical Microscopy include Donald Gavel, director of the Laboratory for Adaptive Optics, and Scot Olivier, a physicist who leads adaptive optics research at Lawrence Livermore National Laboratory. Gavel and Olivier helped to develop the first astronomical AO systems at UC's Lick Observatory on Mt. Hamilton and the W. M. Keck Observatory in Hawaii. For initial development of the AO microscopy system, the researchers used fluorescent dextran beads injected into fly embryos to serve as guide stars. This allowed them to demonstrate the capabilities of their AO system. For a more versatile system, however, the team is developing genetically-engineered fluorescent proteins as biological guide stars. Fluorescent proteins are already widely used to label cellular components for imaging. The green fluorescent protein (GFP), originally derived from a jellyfish, can be spliced onto virtually any cellular protein of interest through genetic engineering, labeling that protein wherever it occurs in an organism's cells. Different color variants of GFP have been developed, so that different proteins can be tagged with different colors. The ideal protein to serve as a fluorescent guide star would be a compact one that looks like a dot, providing a point source of light, and would be located on or near the structure of interest. 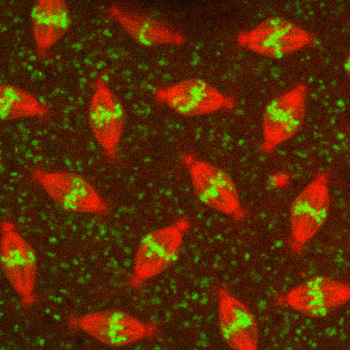 For images of chromosomes in fly embryos, for example, Sullivan is tagging proteins in a chromosomal structure called the centromere to serve as a guide star, while the arms of the chromosomes are tagged with a different color. "When you label the centromere, it's like a big bright dot in the middle of each chromosome," Sullivan said. "We'd also like to find a guide star that works well for neurons and other tissue types. Eventually, we will want to have a whole kit of guide stars for different tissues." So far, the researchers have developed AO systems for a standard wide-field microscope and a more sophisticated confocal microscope. A confocal microscope uses a scanning laser and special optics to collect image data from one section of the specimen at a time, eliminating out-of-focus background light. A three-dimensional image can be created by stacking the sections together. The biological specimen is labeled with a fluorescent protein for the structure of interest, and the fluorescence is triggered by the absorption of energy from the laser light. A related technique, called two-photon microscopy, offers several advantages over confocal microscopy, particularly for deep-tissue imaging. With the new Keck grant, the researchers will modify their current AO confocal microscope into a two-photon AO microscopy system. "Our two main goals are to develop the fluorescent protein guide stars and to develop a two-photon microscope that can use those guide stars for adaptive optics," Kubby said.